road traffic barricades with unfailing precision. Road traffic barricades, or as they’re sometimes called, road barriers are a common site in and around construction zones, special events for traffic control. Almost everyone, whether pedestrian or motorist, has seen these protective devices. And in most cases, these same pedestrians and motorists pay strict attention to them. Typically, the traffic barricades function as a boundary that mustn’t be crossed, a re-director of traffic, or a warning of a nearby hazard. No matter what their purpose, however, the one characteristic they all share is their contribution to public safety. Without these protective devices, chaos would rule and hazards would multiply. Traffic barriers are available in a variety of shapes and sizes, each with its own purpose. Jersey barriers (or k-rail) are the biggest and strongest of the bunch. Made of either concrete or water-filled plastic, this barricade functions as a wall that prevents traffic from crossing into restricted areas, such as closed-lanes or work zones. On the other end of the traffic barricade spectrum are traffic cones. Typically, a bright-orange or other high-visibility color, they primarily form boundary lines on roadways or in event areas. Clearly, road traffic barricades are necessary for efficient road traffic control. For this reason, California decision makers require a reliable resource for traffic barricade rental. Needed is a service that offers expertise, experience, availability, and first-rate service. Roadway Construction Service delivers all the above. But for us, effective traffic barrier services demand more than bright orange cones and mighty walls. They require air-tight planning. 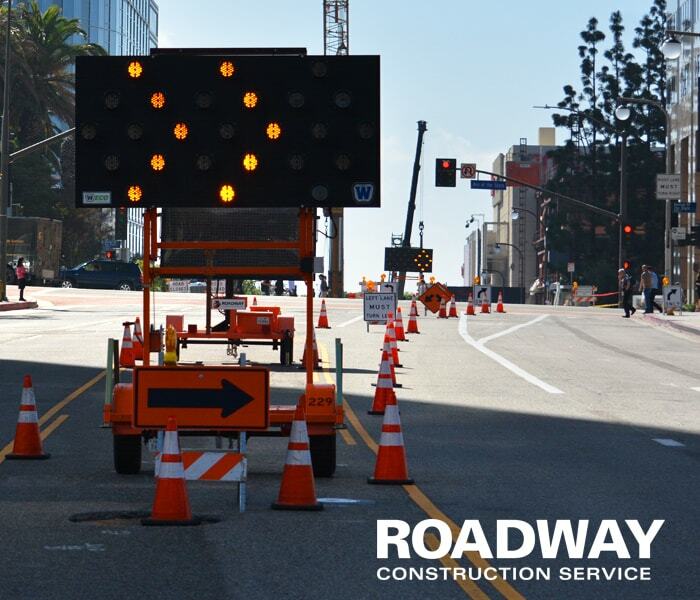 When it comes to traffic control planning in California, nobody is more meticulous than Roadway Construction Service. Detail-oriented? That’s not a strong enough description for our traffic control planning process. Our strategists are absolute sticklers for covering every variable that could impact the performance of deployed road barriers. All conditions, hazards, anticipated traffic flow, and every other critically-important factor is considered before a traffic barricade strategy emerges. When we deliver traffic barriers, you can bet they’re deployed according to a finely-wrought master plan. This thoroughness minimizes surprises – the kind of surprises that can compromise safety and cause budget-draining delays. Would you like to learn more about securing reliable traffic control barricades for a project or event? Reach out to Roadway Construction Service any time. We’ll be happy to provide additional information and answers to all your questions.